The relatively unique and tragic situation of the patient led Macchiarini’s group to test this novel organ transplant on her, which had previously been tried in mouse and pig models. Due to a severe tuberculosis infection, the 30-year-old female patient’s left bronchus had become near-collapse; breathing was so impaired that the patient could no longer carry out simple domestic chores. After several other approaches did not succeed in fixing the bronchus, it was decided that the best option was to remove and replace the bronchus. Normally replacement of large airway pieces and other organs is a significant problem because the patient must be on immunosuppressant medications for life to prevent rejection of the new tissue, and this can shorten the patient’s lifespan by 10 years on average; using the patient’s own stem cells got around rejection (Macchiarini et al., 2008; Hollander et al., 2009). To create the replacement bronchus, a cadaveric donor airway was obtained and decellularized, or treated so that all donor cells would be removed. A segment of trachea was removed from a cadaveric donor and all connected tissues carefully detached. To prevent immune rejection by the patient, which can be caused by the presence of foreign cells and different major histocompatibility complexes (MHC), all cells and parts of cells had to be removed from the donor trachea. 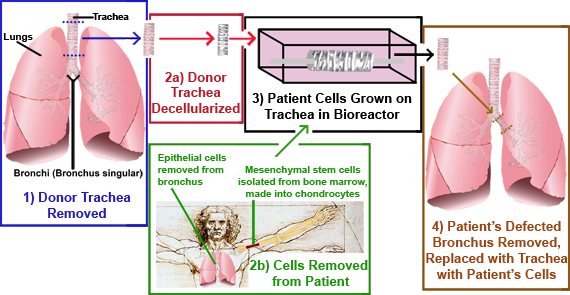 To ensure complete removal of all donor cellular components, the trachea underwent an extensive, previously established decellularization procedure over a period of 6 weeks, which involved the trachea being incubated with detergents and deoxyribonucleases (enzymes that degrade DNA) for 25 cycles (Macchiarini et al., 2008; Conconi et al., 2005). The researchers confirmed that donor cells, including MHC-positive cells, were absent, leaving only the cartilage of the trachea intact (Macchiarini et al., 2008). The decellularized trachea acted as a scaffold for the patient’s cells to be grown on; the stripped airway was incubated in a novel bioreactor with two different kinds of cells from the patient. Epithelial cells were removed from the mucosa, or moist tissue lining, of the patient’s right bronchus. These cells were taken and cultured, or grown, inside the donor trachea. The second type of cell used was chondrocytes. To create chondrocytes the researchers removed bone marrow from the patient and isolated out a population of mesenchymal stem cells (MSCs). The MSCs were induced to differentiate into, or become, chondrocytes using a standard protocol (i.e. specific factors were added to the growth media) for three days. These chondrocytes were seeded on the outside of the trachea. The cells were grown in different media used inside and outside of the bioreactor, media specific to the epithelial cells or chondrocytes. The cells were cultured on the trachea in the bioreactor for four days, at which point the researchers had bioengineered a human airway lacking any synthetic parts (Macchiarini et al., 2008). The portion of the patient’s left bronchus that was near-collapse was removed and successfully replaced by the bioengineered trachea, now acting as a segment of bronchus. After a month in the patient, the transplanted trachea was indistinguishable from a normal bronchus, as compared to the patient’s unaffected right bronchus and the surrounding bronchus tissue. The transplanted airway quickly also displayed completely normal function (Macchiarini et al., 2008). One year later, the graft and patient are still doing fine (Asnaghi et al., 2009). While the case of this successfully bioengineered and transplanted organ is a breakthrough, improvements are needed to make such transplants feasible. Because Macchiarini’s group used a donor graft, the original cadaveric trachea segment, these transplants are limited by available donors. It is hoped that research efforts will lead to fully-tissue engineered organ transplants without the need of such donor grafts. If this is possible, the current shortage of donor tissue and organs can be dealt with and a large aging population can be much more effectively treated (Hollander et al., 2009). Aside from Macchiarini’s report, several other research groups have made breakthroughs in bioengineering organs and tissues recently. One group reported creating skeletal muscle segments using a synthetic scaffold to shape and grow cells on (Bian and Bursac, 2009). Specifically, these researchers used a silicon-based polymer (polydimethylsiloxane, or PDMS) to create micromolds with pegs, or elongated posts, sticking up from the molds. Muscle cells in a gel solution were poured onto the mold and polymerized together. This created a porous skeletal muscle network that was densely packed, with uniformly aligned muscle fibers that spontaneous contracted at the macroscopic level. In the future this approach could create customized, functional skeletal muscle tissue for reconstructing damaged muscle (Bian and Bursac, 2009). Similarly, another group discusses potential in using stem cells to rescue damaged heart muscles (Shimizu et al., 2009). Researchers are also investigating the feasibility of using epithelial stem cells in bioengineered intestines, based on polymer scaffold experiments performed in rats (Day, 2006). Intestinal transplantation, often needed for short bowel syndrome caused by a variety of reasons, is a significant problem because of the extremely active immune system of the intestines (Day, 2006). Other researchers are focusing on the great potential of mesenchymal stem cells (such as were used in Macchiarini’s report) in general wound healing; these cells can differentiate into many different kinds of cells, be isolated in significant numbers, potentially migrate to areas they are needed in, and may be immunosuppressive (Fu and Li, 2009). The use of nanomaterials, which can mimic proteins on the surface of cells and tissues, also hold much potential for future scaffold designs in regenerative medicine (Zhang and Webster, 2008). While Macchiarini’s patient represents a significant breakthrough, it is still a single success that must be repeated to be proven. The transition to the clinic of other stem cell-based regenerative therapies will also require extremely careful characterization of each individual procedure. There are still many obstacles to overcome before such therapies can become common practice. Those interested in receiving stem cell therapies should be aware of the possible risks involved; the Department of Health’s Gene Therapy Advisory Committee lists such potential hazards associated with undergoing stem cell therapies. Asnaghi, M. A., Jungebluth, P., Raimondi, M. T., Dickinson, S. C., Rees, L. E. N., Go, T., Cogan, T. A., Dodson, A., Parnigotto, P. P., Hollander, A. P., Birchall, M. A., Conconi, M. T., Macchiarini, P., and Mantero, S. A double-chamber rotating bioreactor for the development of tissue-engineered hollow organs: From concept to clinical trials. Biomaterials. 2009. 30(29): 5260-5269. Bian, W. and Bursac, N. Engineered skeletal muscle tissue networks with controllable architecture. Biomaterials. 2009. 30(7): 1401-1412. Conconi , M. T., De Coppi, P., Di Liddo, R., Vigolo, S., Zanon, G. F., Parnigotto, P. P., and Nussdorfer, G. G. Tracheal matrices, obtained by a detergent-enzymatic method, support in vitro the adhesion of chondrocytes and tracheal epithelial cells. Transpl. Internat. 2005. 18(6): 727-734. Day, R. M. Epithelial stem cells and tissue engineered intestine. Curr. Stem Cell Res. Ther. 2006. 1(1): 113-120. Fu, X. and Li, H. Mesenchymal stem cells and skin wound repair and regeneration: possibilities and questions. Cell and Tiss. Res. 2009. 335(2): 317-321. Hollander, A., Macchiarini, P., Gordijn, B., and Birchall, M. The first stem cell-based tissue-engineered organ replacement: implications for regenerative medicine and society. Regen. Med. 2009. 4(2): 147-148. Macchiarini, P., Jungebluth, P., Go, T., Asnaghi, M. A., Rees, L. E., Cogan, T. A., Ddson, A., Martorell, J., Bellini, S., Parnigotto, P. P., Dickinson, S. C., Hollander, A. P., Mantero, S., Conconi, M. R., Birchall, M. A. Clinical transplantation of a tissue-engineered airway. The Lancent. 2008. 372(9655): 2023-2030. Shimizu,T., Sekine, H., Yamato, M., Okano, T. Cell Sheet-Based Myocardial Tissue Engineering: New Hope for Damaged Heart Rescue. Curr. Pharm. Design. 2009. 15(24): 2807-2814. Zhang, L., and Webster, T. J. Nanotechnology and nanomaterials: Promises for improved tissue regeneration. Nanotoday. 2009. 4(1): 66-80. Image of “Macchiarini’s Bioengineered Bronchus Replacement” was modified from Wikipedia and redistributed freely as it is in the public domain. admin	Bioengineering, Mesenchymal Stem Cells	adult, clinical trials, mesenchymal, regenerative medicine	© 2009-2010, Teisha Rowland. All rights reserved.